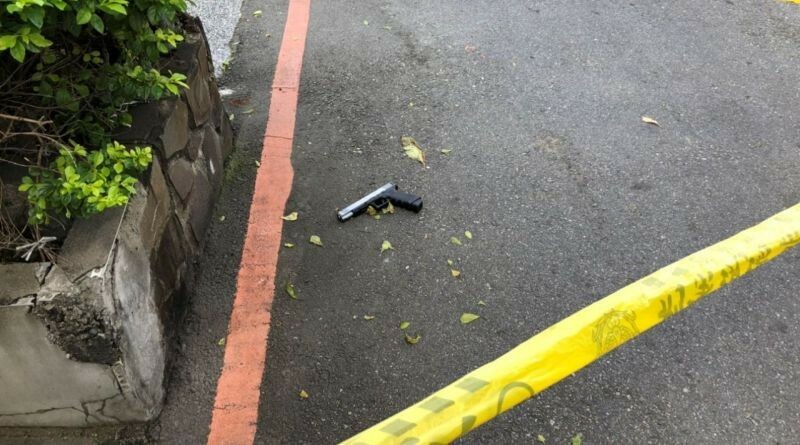 TAIPEI (Taiwan News) -- A 17-year-old male was arrested after firing 30 shots in broad daylight a mere 10 meters from a police station in New Taipei City on Tuesday morning (Jan. 29). At 10:40 a.m. on Tuesday, the suspect, surnamed Chen (陳), stood in front of the entrance to a trading company in New Taipei's Xinzhung District and fired 30 shots in a row, but because it was located 10 meters away from a police station, officers heard the gunshots and rushed to the scene, reported TVBS. After firing a warning shot in the air, the officers arrested the juvenile. Witnesses reported being startled by the sound of gunshots nearby. Two police officers quickly ran out from the police station and confronted the suspect, who was still standing on the spot where he fired the shots. After firing a warning shot, the two officers rushed forward and pinned the suspect to the ground. The officers then seized a modified handgun with two empty 15-round clips and arrested Chen for discharging a firearm in front of the police station. "After firing more than 10 shots the first time, there was a pause of about 10 seconds, before another burst of about a dozen shots was fired again," said an eye-witness to TVBS. The gun and many spent cartridges were left at the scene. When being questioned by police, Chen confessed that he fired the weapon because of a dispute over gambling debts. Chen claimed that after he had accumulated NT$70,000 in debt to the head of the foreign trading company in October, he felt dissatisfied and wanted to give a warning to his creditor. However, Chen was tight-lipped when asked other questions, reported UDN. When police met with the head of the trading company, he denied having ever met Chen. Therefore, police suspect that Chen may have been directed by someone else from behind the scenes.